Earlier this month, our family took a vacation to Florida. One of the places we visited was the Lightner Museum in St. Augustine. Otto Lightner was a "collector of collections", especially collections of items from America's Gilded Age in the late 1800's. You can't help but notice the similarity between these two pictures (hint: it is the alligator hanging from the ceiling). I knew this could not be a coincidence. Since Mr. Lightner had passed away in 1950, I guessed he had not gotten the alligator idea from reading my blog. Maybe the present curators of the museum had read my blog and thought, "What a great idea - let's get that old stuffed alligator out of the basement and hang him on the ceiling". I knew I should have copyrighted my blog! The truth was finally revealed when I found a copy of the above engraving on the wall of the Science & Industry room. Apparently Mr. Lightner had seen this engraving before I had, and decided to recreate it in his museum. Many of the items in this room, and even the beautiful woodworking of the display cases, was typical of cabinets of curiosities. This got me wondering - how many other museums around the world also have stuffed alligators hanging from the ceiling? If you know of any, please tell me. If you are ever in St. Augustine, be sure to visit the Lightner Museum. You will not be disappointed. Here is my favorite item from Mr. Lightner's collection. What American home in the Gilded Age would be complete without a colorful ceramic mandrill? 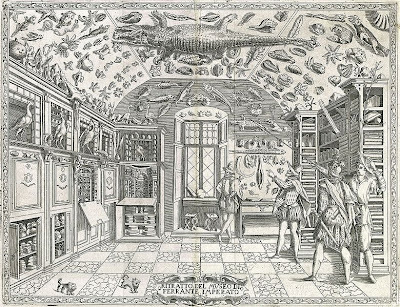 Apparently, the crocodile on the ceiling was a common leitmotif of Wunderkammer or Cabinets of Curiosities in the 17th and 18th centuries. 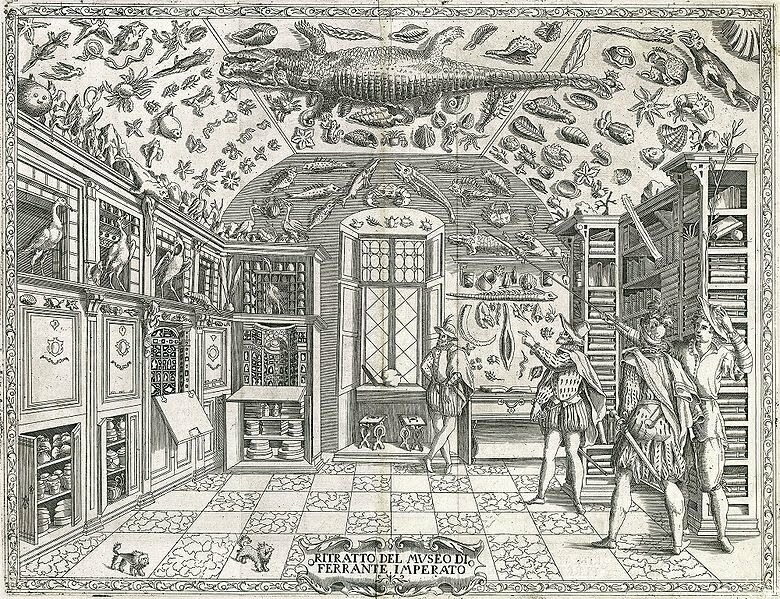 A good reference book is Cabinets of Curiosities by Patrick Mauries. There is a book by Lawrence Weschler about Cabinets of wonder. The Stae House in Hartford, CT has a similar cabinet of curiosities display in its own room on the second floor. Thank you to both Anonymous commenters. I just love these old Cabinets of Curiosities, and I am always interested in seeing ones that have been preserved or restored. Thank you to both Anonymous commenters. I just love these old Cabinets of Curiosities, and I am always interested in seeing ones that have been preserved or restored.Thank you to both Anonymous commenters. I just love these old Cabinets of Curiosities, and I am always interested in seeing ones that have been preserved or restored.Thank you to both Anonymous commenters. I just love these old Cabinets of Curiosities, and I am always interested in seeing ones that have been preserved or restored.Thank you to both Anonymous commenters. I just love these old Cabinets of Curiosities, and I am always interested in seeing ones that have been preserved or restored.Thank you to both Anonymous commenters. I just love these old Cabinets of Curiosities, and I am always interested in seeing ones that have been preserved or restored.Thank you to both Anonymous commenters. I just love these old Cabinets of Curiosities, and I am always interested in seeing ones that have been preserved or restored. Not to mention, you need to action to the Traditional western chanel replica marketplace isn't simple. • Following Zi Xia Chen associated with Lemon Region, Ca and also the Southern Coastline Plaza shopping mall within New york upon Madison Method within Ny knowing. Figured: "Good area housing costs, like a personal business, we must be cautious to invest cash. inch Additionally, Shiatzy Chen additionally exposed which Birmingham shops have been in the actual chanel replica, likely to open up following 12 months, Singapore, the center chanel replica shops tend to be Following strategy. "We wish to open up another shop within London, ideally within the Method Montaigne, however the crucial is actually cash, gentle obtain period might price an incredible number of pounds. inch In this instance, if you're able to discover nearby companions This might be a great shortcut. The initial chanel replica become a reality, however a brand new desire surfaced. Possibly we want a good exterior assistance, we're right now dealing with just about all discussions. military style UK Replica watches appearance, including signs of square watchcase and durable rubber strap etc.. This watch is Watches Replica the biggest characteristic of red translucent dial with metallic red buttons, dials can Replica Rolex Watches be seen through the automatic movement inside the perplexing, instantly set off Designer handbags the movement style movement. In addition, the pointer is also used for the design of Superluminova from fluorescent coating, watch the handbag replica . "I cannot believe the level of professionalism that this hotel property had with me tonight. It is never ok to discriminate against guests for the color of their skin," he wrote. "Earl is a disgrace, calls himself a man but calls the Portland Police Dept on a man who was minding his own business in the lobby of his hotel.". If gym t shirts you have time, bike around the historic homes in the West End (by Pine and Spring streets, for example) and go by Anderson Street in the up and coming East girl power shirt Bayside neighborhood. Take your time and wander. For extra credit (and amazing views and a lighthouse) cross the bridge to South Portland and get on the Greenbelt bike path.